The Banjo Play-Along series will help you play your favorite songs quickly and easily with incredible backing tracks to help you sound like a bona fide pro] Just follow the written music listen to the demo track on the CD to hear how the banjo should sound and then play along with the separate backing tracks. The melody and lyrics are included in the book in case you want to sing or to simply help you follow along. The CD is playable on any CD player and also is enhanced so Mac and PC users can adjust the recording to any tempo without changing the pitch. 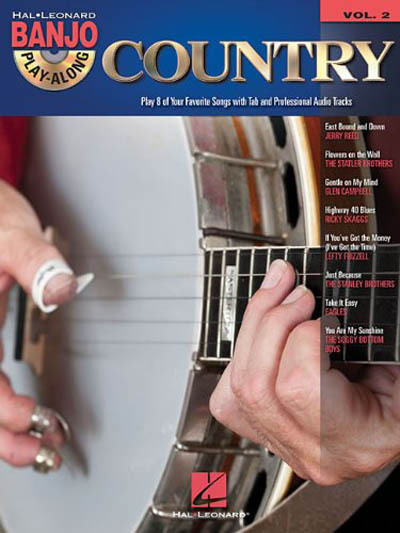 Each Banjo Play-Along pack features eight cream of the crop songs. This volume includes: East Bound and Down * Flowers on the Wall * Gentle on My Mind * Highway 40 Blues * If You've Got the Money (I've Got the Time) * Just Because * Take It Easy * You Are My Sunshine.